- Size: 152mm x 65mm. - Color: blue and dark violet. - Content on the front size: Line “ Socialist Republic of Vietnam”. 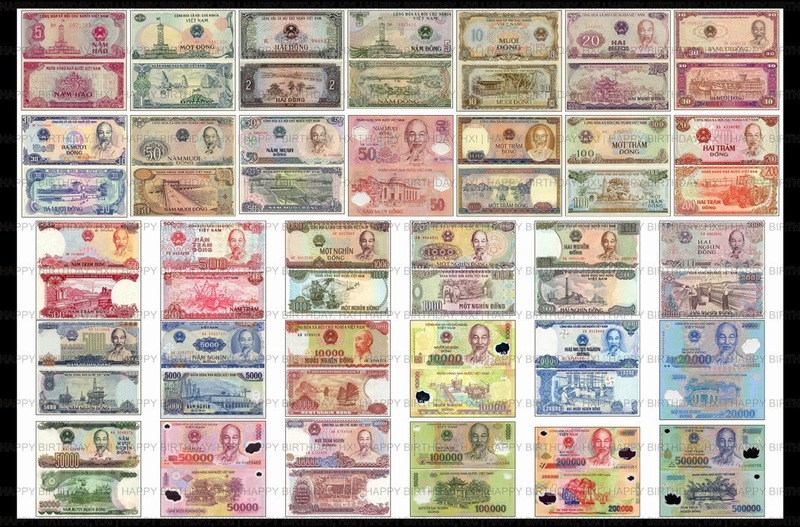 The Vietnamese emblem - Portrait of President Ho Chi Minh – Denomination 500,000 VND in words and in numbers– Traditional decoration & modern net pattern. - Content on the back side : Line “ The State Bank of Vietnam”. Landscape: Uncle Ho’s house in Kim Lien - Denomination 500,000 VND in words and in numbers - Traditional decoration & modern net pattern. - Size: 148mm x 65mm. - Content on the front size: Line “ Socialist Republic of Vietnam”. The Vietnamese emblem - Portrait of President Ho Chi Minh – Denomination 200,000 VND in words and in numbers – Traditional decoration & modern net pattern. - Content on the back side : Line “ The State Bank of Vietnam”. Landscape: Ha Long Bay - Denomination 200,000 VND in words and in numbers - Traditional decoration & modern net pattern. - Size: 144mm x 65mm. - Issued paper: Polymer, good durability, environmental friendliness, special security features such as transparent window with latent or embossed image. - Content on the front side: Line “ Socialist Republic of Vietnam”. The Vietnamese emblem - Portrait of President Ho Chi Minh – Denomination 100,000 VND in words and in numbers – Traditional decoration & modern net pattern. - Content on the back side : Line “ The State Bank of Vietnam” – Landscape: Van Mieu Quoc Tu Giam- Denomination 100,000 VND in words and in numbers – Traditional decoration & modern net pattern. - Size: 140mm x 65mm. - Color : red violet brown. - Content on the front side: Line “ Socialist Republic of Vietnam”. 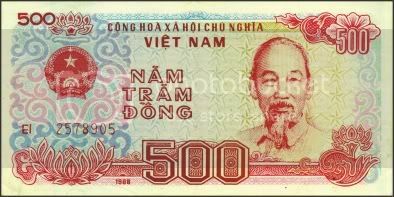 The Vietnamese emblem - Portrait of President Ho Chi Minh – Denomination 50,000 VND in words and in numbers – Traditional decoration & modern net pattern. - Content on the back side : Line “ The State Bank of Vietnam” – Landscape: Nha Rong Wharf . Denomination 50.000 VND in words and in numbers – Traditional decoration & modern net pattern. - Size: 140mm x 68mm. - Content on the front side: Line “ Socialist Republic of Vietnam”. The Vietnamese emblem - Portrait of President Ho Chi Minh – Denomination 20,000 VND in words and in numbers – Traditional decoration & modern net pattern. - Content on the back side : Line “ The State Bank of Vietnam” – Landscape: canned food producing workshop . Denomination 20,000 VND in words and in numbers – Traditional decoration & modern net pattern. - Size: 136mm x 65mm. - Color in general: dark blue. - Content on the front side: Line “ Socialist Republic of Vietnam”. The Vietnamese emblem - Portrait of President Ho Chi Minh – Denomiantion 20,000 VND in words and in numbers – Traditional decoration & modern net pattern. - Content on the back side : Line “ The State Bank of Vietnam” – Landscape: Pagoda Bridge . Denomination 20,000 VND in words and in numbers – Traditional decoration & modern net pattern. - Content in the front side: Line “ Socialist Republic of Vietnam”. The Vietnamese emblem - Portrait of President Ho Chi Minh – Denomination 10,000 VND in words and in numbers – Traditional decoration & modern net pattern. - Content on the back side : Line “ The State Bank of Vietnam” – Landscape: Ha Long Bay. Face value 10,000 VND in words and in numbers – Traditional decoration & modern net pattern. - Size: 132mm x 60mm. - Color : dark brown on a green yellow background. - Content on the front side: Line “ Socialist Republic of Vietnam”. The Vietnamese emblem - Portrait of President Ho Chi Minh – Denomination 10,000 VND in words and in numbers – Traditional decoration & modern net pattern. - Content on the back side : Line “ The State Bank of Vietnam” – Landscape: Oil & Gas exploiting field. Face value 10.000 VND in words and in numbers – Traditional pattern & modern net pattern. - Size: 134mm x 65mm. - Content on the front side: Line “ Socialist Republic of Vietnam”. 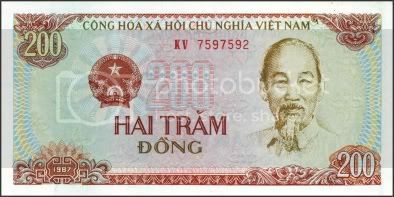 The Vietnamese emblem - Portrait of President Ho Chi Minh – Denomination 5,000 VND in words and in numbers – Traditional decoration & modern net pattern. - Content on the back side : Line “ The State Bank of Vietnam” – Landscape: Tri An Hydropower Plant. Denomination 5,000 VND in words and in numbers – Traditional decoration & modern net pattern. - Color : dark brown. - Content on the front side: Line “ Socialist Republic of Vietnam”. The Vietnamese emblem - Portrait of President Ho Chi Minh – Face value 2,000 VND in words and in numbers – Traditional decoration & modern net pattern. - Content on the back side : Line “ The State Bank of Vietnam” – Landscape: Weaving Workshop. Denomination 2,000 VND in words and in numbers – Traditional decoration & modern net pattern. - Content on the front side: Line “ Socialist Republic of Vietnam”. The Vietnamese emblem - Portrait of President Ho Chi Minh – Denomination 1,000 VND in words and in numbers – Traditional decoration & modern net pattern. - Content on the back side : Line “ The State Bank of Vietnam” – Landscape: wood exploiting site. Denomination 1.000 VND in words and in numbers – Traditional decoration & modern net pattern. - Size: 130mm x 65mm. - Color : lotus red. - Content on the front side: Line “ Socialist Republic of Vietnam”. The Vietnamese emblem - Portrait of President Ho Chi Minh – Denomination 500 VND in words and in numbers – Traditional decoration & modern net pattern. - Content on the back side : Line “ The State Bank of Vietnam” – Landscape: Hai Phong Port. Denomination 500 VND in words and in numbers – Traditional decoration & modern net pattern. - Color : red brown. - Content on the front side: Line “ Socialist Republic of Vietnam”. The Vietnamese emblem.- Portrait of President Ho Chi Minh – Denomination 200 VND in words and in numbers – Traditional decoration & modern net pattern. 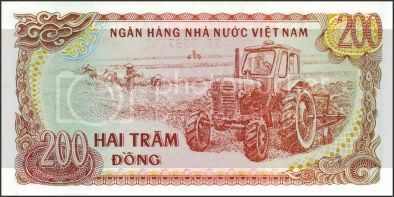 - Content on the back side : Line “ The State Bank of Vietnam” – Landscape: Agricutural production. Face value 200 VND in words and in numbers – Traditional decoration & modern net pattern. - Size 120mm x 59mm. - Color : balck brown. - Content on the front side: Line “ Socialist Republic of Vietnam”. The Vietnamese emblem.- Portrait of President Ho Chi Minh – Denomination 100 VND in words and in numbers – Traditional decoration & modern net pattern. - Content on the back side : Line “ The State Bank of Vietnam” – Landscape: Pho Minh Tower. Denomination 100 VND in words and in numbers – Traditional decoration & modern net pattern. Banknote 500,000 VND issued on 17 December, 2003.